Our range of jewelry vacuum casting Digital Die Press With Timers is fabricated using high-grade raw material that we procure from certified vendors of the market. Establishment in the year 2004, Fluid Power Machines Private Limited is known in the market as leading business organization striving for total customer satisfaction by manufacturing, exporting, importing, supplying, trading and Distributing superior-quality and excellent-performance Hydraulic Cylinders & Power Packs. We are a leading name in the field of manufacturing and exporting a wide range of Fluid and Motion Control Solutions like Hydraulic Power Packs, hydraulic press,scissor lift, Intensifiers and Cylinders. 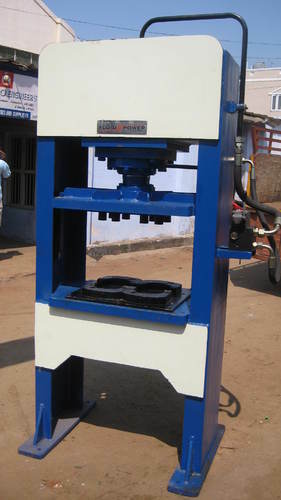 Our product range includes Hydraulic Cylinder, Scissors Lift, Valve Body Test Rig, Hydraulic Press, Areca Leaf Plate Making Machine, Hydraulic Power Pack, Hydraulic Jack, Plate Making Machine and Hydraulic Machines. Our products are designed and developed in compliance with the international quality standards and are manufactured from quality components to attain high efficiency.While manufacturing our extensive product range, our company makes use of hydraulic energy concept, which can smoothly push or drag objects. The wide range offered by us meet up the needs of bore well rig manufacturers, laboratories and foundry equipment. We also offer customized solutions to our clients at market leading prices.